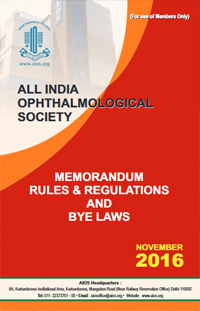 The All India Ophthalmological Society (AIOS) was established in the year 1930. It is a registered society under the societies registration act of 1860. Membership of the society has continuously grown over the years and currently it has over 20,000 life members. The objectives of the society are cultivation and promotion of the study and practice of ophthalmic sciences, research and man-power development with a view to render service to the community and to promote social contacts among ophthalmologists of the country. The society organises annual conferences in different parts of the country. In these conferences, a number of scientific activities that include instruction courses, symposia, lectures, post graduate refresher courses, booth lectures, wet labs, surgical skill transfer courses etc. are conducted for the promotion and mutual exchange of knowledge in the field of ophthalmic science. The society also gives incentives to the members in the form of awards, orations, prizes and Fellowships in recognition of their services in the various specialities. The President of the society has the discretionary power to form various sub committees related to various activities. These sub committees provide recommendations to the Governing Council for their consideration. The AIOS Headquarter is located at Karkardooma, New Delhi.